We passed the Kleenex box down the row. Each of us grabbed a tissue, then waited interminable minutes as the pastor droned on and on. I avoided looking at the casket, still in shock from the sudden illness that took away my best friend. She was a strong believer, so we fashioned her memorial service around the music she loved, favorite Bible verses, and a time of sharing memories. But for some reason, the pastor seemed intent on turning her service into a revival meeting. In fact, as a biblical counselor and a Stephen minister, I have participated in or attended hundreds of funerals. I have yet to hear that anyone became a Christian because someone preached a Gospel message during a memorial service. When people grieve – particularly at the beginning of the process – they live in denial and shock. How could this horrible thing happen? Why did God allow this death? No matter how strong our faith, these questions can hound us. Busyness saves us during the first days. We arrange for the service, deal with the funeral home, wrap up the last hospital stay and order flowers. We make copies of the death certificate, choose a casket or an urn, and reserve the cemetery plot. I came home from the ICU, took a shower to wash away hospital smells, and fell into bed to cry myself to sleep. I did not pray for the souls of the world. Now the family and I were supposed to consider the direction of our eternities when we were still trying to process through the fatigue and questions? I don’t think so. 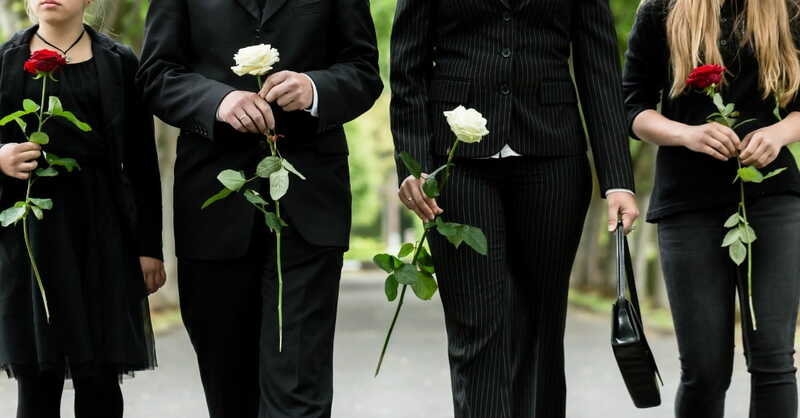 What should a pastor and a church do to help mourners? What would be more effective ways to share the Gospel? Guard your tongue. While in the ICU dealing with doctors, decisions, and dread, we did not need pat answers of “This must be God’s will” or “She’ll be better off in heaven.” Of course Deb is better off now, but we are not. We are facing an emotional crevasse we can’t deal with. We needed hugs and shared tears, not Bible verses or religious platitudes. Statements such as “God needed another angel” or “God works all things together for good” nearly caused me to implode. If God needs another angel, he can create one with a blink of his eye. Sharing Bible verses only reiterates that my verse is not your verse – my grieving is not yours. A life principle is attached to Romans 8:28, but God will reveal that to me in his time. The ICU or the funeral home is not the time to espouse your reasoning behind the death. Bring a care package. One friend came into the ICU with a basket of snacks, Post-it notes, blank thank you cards, pens and paper, gift cards for later, fruit, and nuts. This was a tangible example of compassion and was so appreciated. Fortunately, this friend did not pepper the basket with Bible verses. Assign deacons to the home. Ask a deacon to stay at the house during the funeral. Thieves read obituaries and know the home will be unattended. In some cases, they pull up a truck and empty the home’s contents, leaving another tragedy for the returning family. Another deacon could be assigned to clean the home. When a family has been living in the ICU, taking turns staying night and waiting with fear for that last breath, they do not have the energy to stagger home and clean up for the company that will soon visit. Mow the lawn. Trim the landscaping. Deadhead the flowers. No family feels like doing home maintenance while dealing with a life-altering illness. Yet to return to a freshly-manicured front yard would be a source of encouragement. Remember the pets. Offer to take care of the pets with fresh food and water. Whether you’re a cat person or a dog-lover, our animals give us unconditional love. A comforting purr or a face-lick are often the most welcome comfort. Deb owned two cats. Numerous friends offered to come in and make sure Jasper and Sweet Pea were okay. Another tangible example of meeting the urgent need. Reconsider the food. Instead of a chocolate cake or another potato casserole, bring a sack of paper goods to the home. Cups, napkins, paper plates, coffee, tea, milk, Cheerios for the kids. These more practical gifts are necessary, but how many of us have a stock of paper goods to feed extended family? Someone has to drive to Wal-Mart to purchase them. Be the person who thinks of the unusual, yet necessary. And while we’re on the subject of food – if you have a favorite casserole, bring it in a disposable container. After the funeral, no one wants to wash dishes and hunt for the owner of the Pottery Barn dish. Also include a list of ingredients. With all the food allergies people suffer, no family needs an added trip to the ER because Junior ate some hidden peanuts. Consider counseling needs. In the weeks after the funeral, offer three sessions of grief counseling by pastoral staff or assign a Stephen minister to each family member. It takes a good month or more to finish details, pay bills, and deal with reality. Then the real pain begins. Mourners need someone to share their grief when all the casseroles are eaten and extended family are gone. Be creative. Don’t ask, “Do you need anything?” or “What can I do?” Mourners are not thinking clearly. They cannot imagine the help they will need. Often, they don’t ask for anything. Three weeks after the funeral, one of my writer friends met me at a unique coffee shop – quieter and more out-of-the-way than the usual place with the green logo. She bought my drink and we sat together at a table. Her simple statement offered me an opportunity to process through another piece of my grief. “Tell me about your friend,” she said. Then she sat quietly as I worked through memories and even expressed my anger about the horrible event. She did not judge, even when I said, “I’m mad as hell.” She let me talk and share my pain. Then we walked to a boutique together – adding something fun to a difficult day. Instead of preaching the Gospel at a funeral, show the Gospel by sharing compassion and mercy. Grievers will appreciate the power of our belief by seeing it in action. They will know we are Christians not by the pounding of the pulpit, but by our love.